Each award group has requirements covering basic training, performance, tenure, and certification. Scouters earning the Key Award in one program area MUST complete ALL requirements (including tenure) for a subsequent Key Awards in another program area. 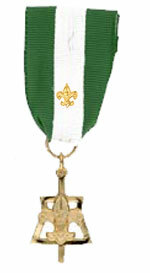 Scouters earning a Key Award cannot use the tenure for the Key Award toward earning the Scouters' Key Award in the same program area. Note: Other leaders in each program area described above (except Commissioners) may earn an appropriate Training Award. Commissioners may earn the Arrowhead Honor.